Adelaide has slumped to its heaviest SANFL loss ever despite a career-best four-goal haul from young forward Elliott Himmelberg. After leading Port Adelaide by two points at quarter-time, the SANFL Crows were overwhelmed by the Magpies 8.6 (54) to 17.10 (112) on Saturday afternoon. 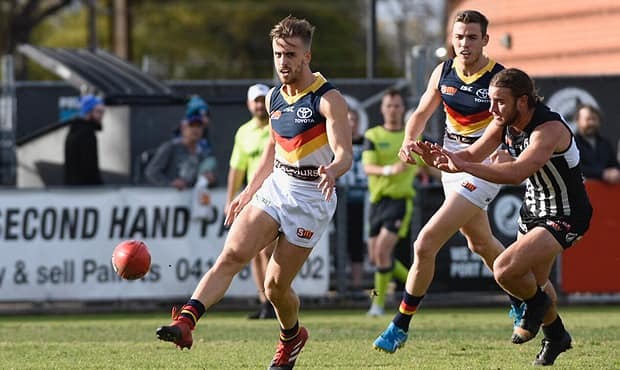 The home side piled on 15 goals to Adelaide’s five majors after the first break to run out convincing winners in difficult conditions at Alberton Oval. The final 58-point margin was the Club’s worst loss since entering the competition in 2014, surpassing 55-point defeats to Norwood (2014) and Central District (2016). Himmelberg’s performance was among several positives to come from the contest despite the disappointing score line. The first-year forward competed hard all afternoon and took six marks alongside his four-goal effort in his best outing as a Crow. Long-kicking Crow Paul Seedsman put his hand up for a senior recall with his most complete performance since returning from a long-term groin injury. The 25-year-old broke the lines to collect a team-best 29 disposals along with eight marks and six inside 50ms. Seedsman also kicked Adelaide’s opening goal of the game with a trademark long bomb in the first term. Young defender Tom Doedee battled bravely in Adelaide’s under-siege defence. The 20-year-old claimed a match-high six intercept marks, including several courageous efforts, and collected 23 disposals across half-back as he continues to hunt an AFL debut. Harrison Wigg (25 possessions, six clearances) and Jordan Gallucci (24 possessions, seven tackles) never gave up, while Myles Poholke continued to show promise in his role as a strong-marking mid/forward. Young onballer Matthew Signorello looked dangerous in the opening half, but suffered a concussion late in the second term and did not feature after half-time. Most key statistics were even across the board, but the Magpies smashed Adelaide in inside 50ms 32-55, primarily due to a string of costly Crows turnovers. Crows SANFL coach Ryan O’Keefe said it was execution, rather than effort, that hurt his side. “You can’t give a team like Port Adelaide that many chances to attack because they’ll make you pay, and that showed today,” O’Keefe said. “I can’t fault the boys’ effort but it comes back to fundamental skills. We didn’t play to our potential as a team. The Crows were under siege early despite kicking with a strong breeze in the opening term. Port Adelaide dominated play yet squandered several chances up forward, finishing with six behinds from eight scoring shots in the first quarter. A gutsy chase from Doedee in defence saved a certain goal and eventually sparked Adelaide into action. Seedsman pushed forward to nail a huge goal from beyond the arc before back-to-back majors from Himmelberg gave the Crows a two-point lead at the first break. Four unanswered Port Adelaide goals, including one after the siren, pushed the Magpies out to a handy 16-point lead by half-time. Adelaide was only 22 points adrift at the final change following late goals to Troy Menzel and Jonathon Beech, who finished with two for the day. But it was all one-way traffic in the final term as the Magpies ran away with the result. Adelaide’s next SANFL game is against West Adelaide at City Mazda Stadium on Saturday, July 15.